DEAR VISITORS, my name is Anjes. Raised in Germany with Dutch roots in a very musical small fishing village, that in the 60ies developed it’s own music industry with some worldwide renowned bands a talent was passed on. The villagers are known to be either good at soccer or singing and after my teacher noticed not a soccer but quite a vocal ability I joined the primary school choir in first class. The moment I could afford it I started vocal training at the age of 18. During my economic studies and my subsequent careers in the entertainment industry, singing remained my constant companion. More than twenty years ago I started out with music school-, big- & cover band projects until now supporting musicians as studio singer and since 2005 I receive regular bookings as Wedding Ceremony & Event Singer. As a result of being part in different projects I have encountered and tried various musical styles since. 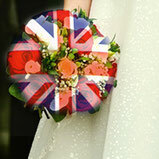 Do you want to know more about my wedding-services or do you have any questions? Then do not hesitate to contact me. I am looking forward to your inquiry (German, Dutch and English) by mail or phone. Anjes's voice is absolutely beautiful, and it was the perfect touch for our wedding day. It was just such a treat to have her singing during our ceremony - she looked stunning and her voice sounded just effortless. She was totally accommodating in helping us choose songs as well - I can't recommend her enough!! !